On Sale Now! Free Shipping Included! 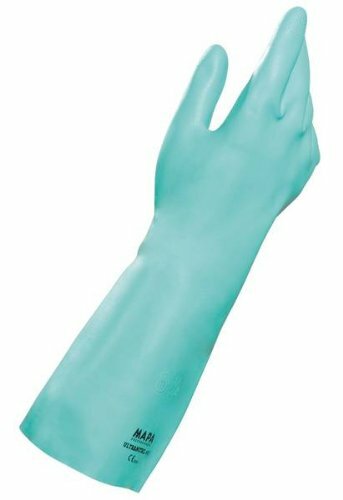 Save 2% on the MAPA StanSolv A-14 Nitrile Unlined Heavyweight Glove, Chemical Resistant, 0.022'' Thickness, 14'' Length, Size 9, Green (Box of 12 Pairs) by MAPA Professional at SMIFCU. MPN: 474019. Hurry! Limited time offer. Offer valid only while supplies last. Mapa unlined chemical resistant glove. Unique Z-pattern grip provide secure handling of hard-to-grasp items. Ultra-long chemical protection. Mapa unlined chemical resistant glove. Unique Z-pattern grip provide secure handling of hard-to-grasp items. Ultra-long chemical protection. Optimized service life. Excellent mechanical resistance (abrasion, perforation). Excellent protection during intensive handling of high-risk chemical products. Applications: Automotive/mechanical industry: treating/degreasing metals with aggressive solvents; Chemical industry: handling drums of chemical products; Mechanical industry: etching/degreasing; Other industries: application of pesticides, cleaning of printing-press rollers, maintenance. Certificate of conformity and regular production inspections on the manufacturer's premises by the notified bodies. Mechanical Hazards EN 388 (performance levels): puncture resistance, tear resistance, blade cut resistance, abrasion resistance. Specific Chemical Protection EN 374 (Chemical product): methanol, n-heptane, sodium hydroxide 40 percent, sulphuric acid 96 percent. Wrist: straight cuff. Interior finish: chlorinated. Exterior finish: embossed texture. Size: 9. Green color. Measures 14-inches length by 0.022-inches thickness.